It's my favorite time of year -- cool autumn air, Halloween and best of all, the Sun moved into in Scorpio this week! There's plenty of deep, intense, soulful Scorpio energy in the sky right now that's sure to have an impact on our Scorpio loved ones as well as the rest of us. 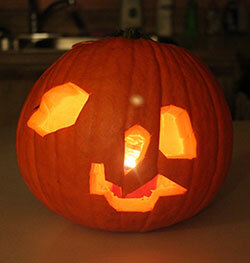 Jack-o'-lantern designed by Eli, my first son and favorite Scorpio. If you're looking for a meaningful gift for the Scorpios in your life, the 2014-2015 birthday reading for Scorpio is now available for pre-sale at a substantial discount. Astrology, applied correctly, can offer tremendous insight for problem solving as well as personal growth -- I can't think of a better gift for your favorite Scorpio than a reading by Eric covering the coming solar year. His readings offer an excellent source of motivation as well as helping with one's inner quest. It's going to be an interesting year, one of the most meaningful in a long time for Scorpios. Three planets entered Scorpio this week, followed by a solar eclipse. And Saturn finally makes its first moves out of Scorpio later in the year, transitioning into Sagittarius. This is a total change of energy and shift of emphasis. The Scorpio reading will include two astrology segments, together about an hour in length, plus a special tarot reading using the Voyager Tarot by James Wanless. Plus, it includes access to last year's reading so you can review. The way the Planet Waves pricing structure works, we give the best rate to early purchasers. That's available right now. We've also shortened the window for the very lowest price -- which is currently $24.95. This will be available through Sunday evening, October 26. The price will then increase gradually, topping off at $39.95 once it's published. So currently, it's available to you at a substantial savings. There's one other aspect to this reading that you should know about. We now include a community discussion (scheduled within a couple of weeks of the reading publication date) where we talk about astrology and in particular, the astrology related to your sign. You (or your gift recipient) will be able to speak directly with Eric and hear from others experiencing similar astrology as you are. Remember, the lowest price offer lasts only until Sunday evening, so take advantage of it now. Order online or call me at (877) 453-8265. If you order by phone, I can offer you a package deal including an early renewal offer for you, and if you're not a member or subscriber, a discount introductory offer. Thanks for supporting Planet Waves!